I wonder how many friends Chandos have made for their 20th century Italian music series: Casella, Dallapiccola, Petrassi and now Castiglioni; possibly not that many. It's still a very significant series that must be costing a considerable amount to put together. I first came across Castiglioni on attending a BBC Prom concert about six years ago; it was conducted by Oliver Knussen. Since then his music has gradually grown in profile in the UK (review ~ review). He has been through the stylistic mill and in the late 1960s gave up on Italy and worked in America. A work like Tropi of 1959 demonstrates his Darmstadt influences. But he re-thought his musical language and for a decade or so produced music that was utterly original. Quite clearly he had found himself. He died all too young. “What! Those lesser thirds so plaintive. Probably not. Castiglioni has chosen only cheerful and un-troubled movements, which, with his marvellous orchestration makes for a work of utter charm and delight. I was much taken by the middle work on the disc. It is scored for orchestra alone Altisonanza (meaning high sounds). It falls into three movements and lasts over twenty minutes. The opening Entrée runs for more than nine minutes and is marked by a fecundity of ideas which spark each other into action. The Sarabanda provides brief respite in the centre of the work and shows again the composer's partiality for older forms which he had started to utilise mid-career. But this is twentieth century music, make no mistake. Castiglioni’s interests include: Boulez and aleatoric techniques as in the woodwind writing in movement one. There's a suggestion of bird-song in movement three which points to Messiaen. Add to this the rhythmic vitality in the third movement marked Perigordino. Webernesque pointillism was also hinted at in the second movement yet the composer’s total originality again shines through. Psalm XIX is the text beginning ‘The Heavens declare the glory of the Lord”. Whilst listening I have felt that I have never really heard anything quite like it. The scoring is surely unique: chorus, orchestra and two stratospheric sopranos — a dangerous thing in itself as I know from a birthday party - one being a coloratura. The orchestra includes a harpsichord (again) prominent against the two sopranos on their first entry. The chorus is often pitted against the two soloists but they spit the text out in syncopated monosyllables, sometimes speaking, sometimes singing cluster chords and against punched harmonies from the orchestra. Sometimes the chorus writing exposes the men only, sometimes the women. The fervent performance is also truly extraordinary and compelling. The preparation that must have gone into this is quite incalculable. Gianandrea Noseda, the motivating force behind much of this Chandos series is clearly at his best here. The recording team, much stretched by the composer’s demands, makes the whole thing work convincingly. So, a fascinating CD, texts and translations are given ... and clearly. There are photographs of the composer and of the performers. 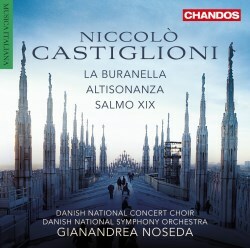 The result is, I now feel, that I would like to hear more Castiglioni, especially the purely orchestral music. I notice that ‘Inverno in-ver’ of 1973 is available on CD. That said, perhaps Chandos will soon treat us to another release in this ever-growing and absorbing series.